Summer-Glau.com Forum » Summer Glau » Vote For Summer » Dark Horse VS: River Tam vs Buffy Summers! 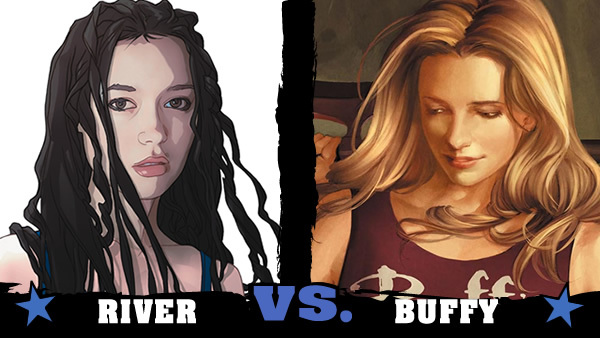 Dark Horse VS: River Tam vs Buffy Summers! A site specialized in comics have released a poll to know wich of the two young women would win on a fight. Admit it. You've always wanted to know. Well, we're giving you the chance to decide once and for all who would win in a fight, River Tam of Serenity or Buffy Summers of Buffy the Vampire Slayer! Buffy might be super-strong and super-tough, but River's got super-smarts and the moves to boot! It's a Joss Whedon super-gal battle royale! Despite her frail appearance and petite stature, River's skill at hand-to-hand combat is virtually unstoppable. "But perhaps the most important question of the evening was one of the earliest, as Whedon was asked who would win in a fight, Buffy Summers or River Tam? He admitted that this was the one question of the evening for which he wasn't prepared. He first sought to answer the question democratically, conducting an instant poll of the audience; the results were about a fifty-fifty split (my tenuous grasp of journalistic objectivity prevents me from revealing my vote on the matter). After buying sufficient time to consider the question, Whedon finally reasoned that, while Buffy is stronger, River's whole thing is being programmed to kill, so…He trailed off there, but I think that's a pretty clear vote for River. (What? I said my objectivity was tenuous.)" Speaking of Buffy the Vampire Slayer, here's an interview with James "Spike" Marsters. James talks about his career, the Mars rover Curiosity, 50 Shades of Grey, accents, whether he'd play Spike again and more. Amazing behind the scenes videos from Jeff Pruitt, Buffy stunt coordinator, featuring Sophia Crawford, Sarah Michelle Gellar's stunt double. It's finally here! I decided to review all of "Buffy's" first season in one shot- get ready for 12 episodes of nineties greatness! Buffy and River - Sisterhood of the Axe. I know I am very late to vote, but now after watching a few seasons of Buffy I'm stumped. I mean, both characters are strong when fighting. But just like a lot of you have said, River was programmed to kill and has no choice, whereas Buffy, has a choice, and as a slayer isn't chosen to kill humans, but vampires and demons etc.